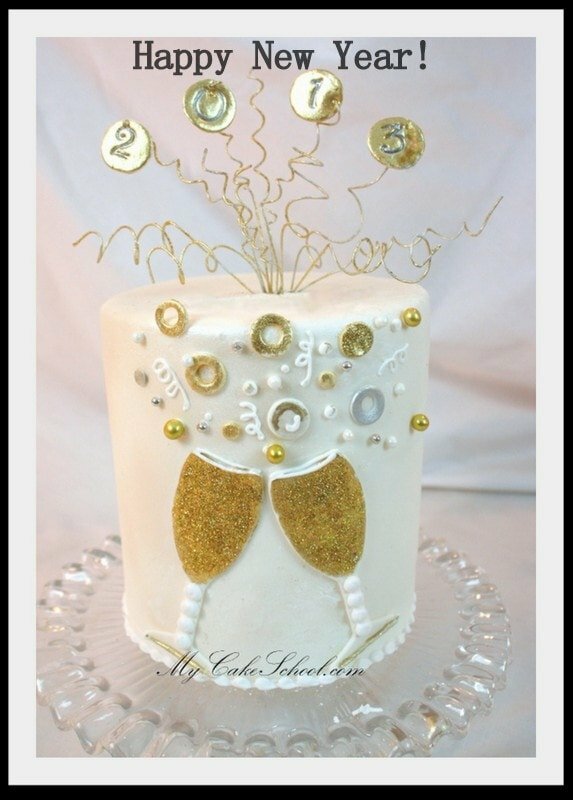 New Year’s Eve Cake ~ A Blog Tutorial! Hi everyone! Well, as hard as it is for me to put away Christmas decorations, I always look forward to the start of a fresh new year! There’s nothing better than a clean slate. I want to wish all of you a 2013 that is FILLED with blessings, love, and wonderful surprises! Let’s kick things off with a cake design that we came up with today~ it’s fun, festive, dramatic, and it wants to ring in the new year with YOU! Our cake is a 6″ (approx. 6″ tall) cake which is covered with fondant (Satin Ice). Dragees and various forms of bling~ Sugar pearls, white disco dust, gold & silver hologram twinkle dust–if it sparkles and shines, grab it. Number Stamps- I used my plastic stone stamps that I bought from Michael’s to make impressions. 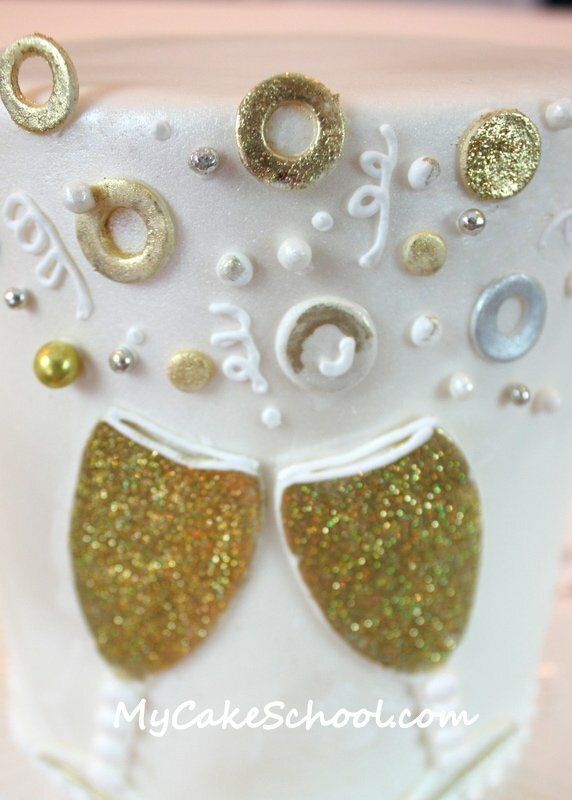 Next, I painted the glasses with gold luster dust (I used Gold Highlighter dust mixed with a little vodka).- Then, I sparkled them with my gold hologram twinkle dust before my “paint” had dried! 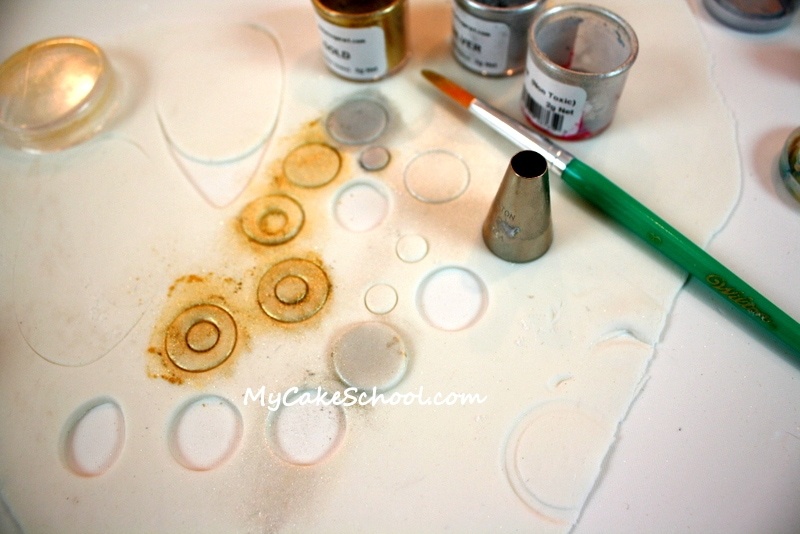 Next, I rolled out some gum paste, let it set for a few minutes, and then cut out circles (and circles within circles) using my Wilton piping tip 12. Use whatever circle cutters you’d like. I dusted over them with silver and gold luster dust, and also pearl dust. 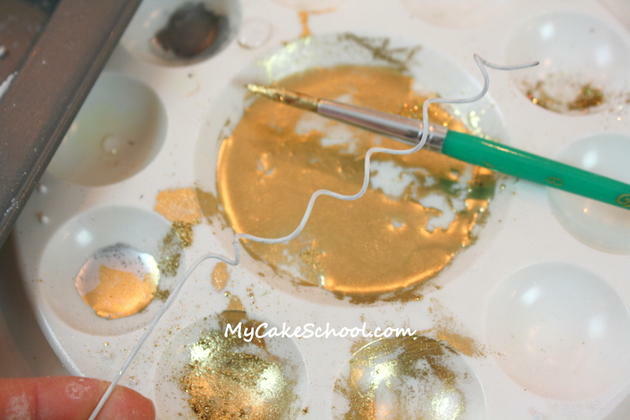 ** Sometimes I use gold and silver highlighter dust too which is extra metallic and shiny..but only use these on pieces that can easily be removed and won’t come into contact with your cake. 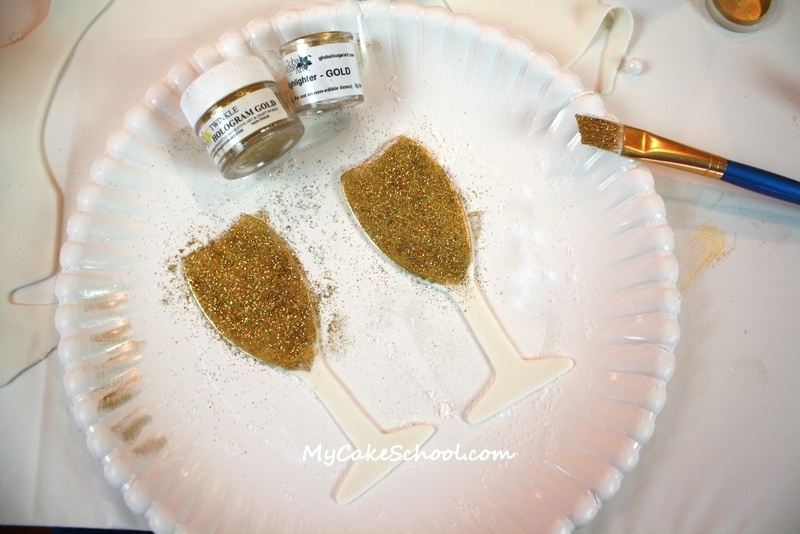 I attached my champagne glasses, while still soft, to the cake with a little royal icing (a little water, piping gel, or sugar glue would work also). Then I attached the “bubbles and bling” to the cake also with royal icing. 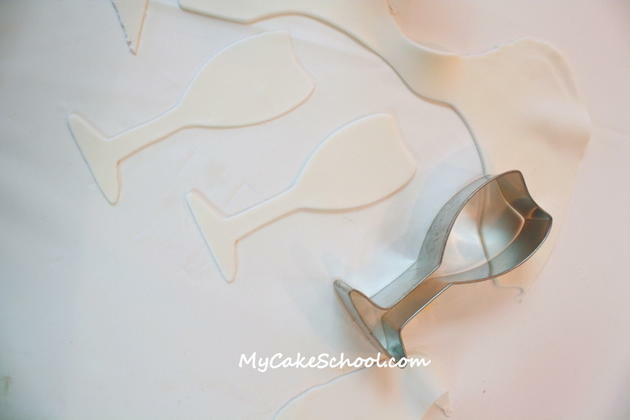 Using my piping bag fitted with a Wilton tip 2, I piped embellishments onto my glasses, including “pearls” of icing onto the stems of the glasses, and little curlicues here and there on the cake. I also used gold and silver dragees for just a little bit of extra drama ;0). I wanted my cake to have some extra height, and I achieved that with one of my favorite quick and easy decorations–curled floral wire! This is paper covered 20 gauge wire which I curled around my paintbrush, and then painted with our gold highlighter “paint” created with the dust mixed with a bit of vodka. Don’t paint the part that will be inserted into the cake. Also, if the idea of wire in cake bothers you, just gather the floral wire and push the ends into a drinking straw or stir straw…whatever size the project calls for. Trim the straw to the height of the cake and it acts as a barrier between the wire and the cake. After pushing the gold wire into the cake, I decided to push my round numbers onto the wire, as if they were little ornaments. The numbers were stiff enough to hold their shape but soft enough in the center for me to push the wire through them. You could also press the numbers onto the wire with a little melted chocolate or royal icing as your glue. And here we are with our festive Happy New Year cake~ Cheers! Awesome post. Love the cut outs! I love this cake and the simplicity of how it was put together. It is so festive. Happy 2013!!! I would love to have this beauty sitting on my table New Year’s Eve. Happy New Year to you and your family. Thanks so much everyone– HAPPY NEW YEAR! How did you keep the standing wire with the 2013 up? I tried and they were too heavy and kept falling over! Hi Susie–I’m sorry that you had trouble–thanks for letting us know. It could have been a few things– my gum paste numbers were very thin and therefore were very lightweight…if yours were a little thicker (heavier), that may have caused issues. Also, my wires were very long and so they were anchored deep into the cake. If I ever have trouble with my wires “spinning” or tilting, I push them into stir straws that not only are nice and long, but they make great anchors because they “grab” a little cake as they are pushed in, creating an even tighter fit. My cake may have even been denser (I used a white almond sour cream recipe). While this design should work with all types of cake, if yours was a very soft cake and the wires were weighed down a lot by the numbers, it could make a difference. I’m sorry that you couldn’t follow the original plan of this design but I’m sure that nobody knew the difference! We all have to move to Plan B sometimes– and often the end result is even better than the first plan ;0) — I hope that you have a happy new year! That is really cute. I like that. So cute and looks easy. Happy New Year to you and your family. 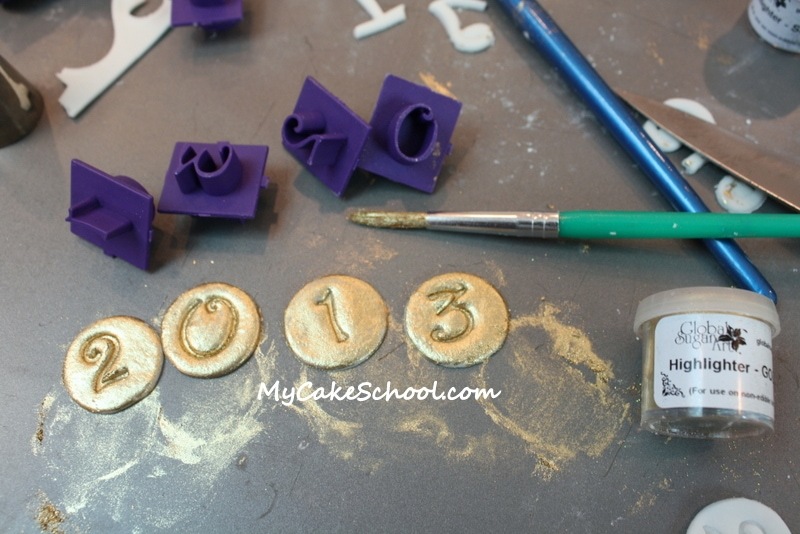 Can’t wait to see more cake decorating indeas you have for 2013. Thank you Anita, and much happiness to you in the new year. In what department did you find the number stamps? I love those! Hi Gina, I think on the clay aisle…or possibly where they keep their cement/mosaic/stepping stone supplies. It’s not on the cake aisle. HAPPY NEW YEAR MELISSA AND BEBE, this was a great year learning from you, I’m so thankful for all that you do for us, teaching and replying to our questions, that’s a big help for us your students. God bless both of you and your family.